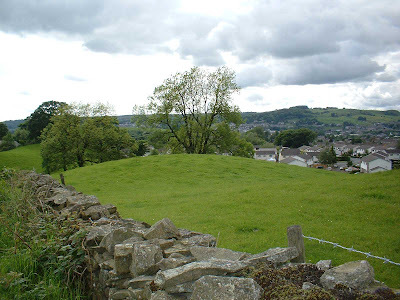 As well as the more well known motte and bailey castles in and around Kendal, there are at least two mottes in Kendal, with, perhaps dubious, antiquity. This basically means that they may, or may not be medieval motte and bailey castles. They may be lesser sites, possibly centres of administration and not defensive structures, or they may just be natural geological occurances. Whatever, I think they deserve some mention here. The first of these sites is situated near a farm called Birds Hill Farm, about a half a mile up the old Sedbergh road. The site is tucked away in the corner of a field, with a stream running around its base. The motte, if that is truly what it is, is about 15 metres high on its Southern flank where the stream seperates it from the rest of the field. The Northern and Eastern flanks are about three metres high. 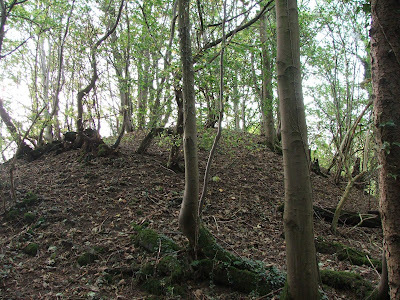 There's no doubt that this motte is made from a natural feature in the landscape, but at the same time, it's also possible that whomever used it as a place of local administration, built upon it to further enhance its position. I don't have any dates regarding the use of this motte, or any further history at all. The second motte is situated in the middle of a busy housing estate to the North of the town, sandwiched between Kettlewell Road, Aysgarth Close and Low Garth. This motte is reputedly the suggested site of a pre-conquest administrative centre. 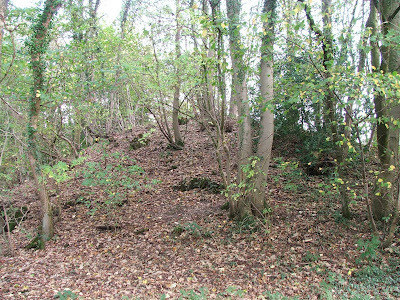 The motte has steep sides and may have been an early medieval fort of some sort. It stands to a height of around eight metres, and is very well defined. I'm again unable to find any datings for this site, who built it or what it was used for, and there is some suggestion that it may even be a spoil heap from the nearby railway. There are even a few sites within Kendal, and one or two on the outskirts of town that are known or at least thought to have been very early medieval mottes, perhaps sites of local administration rather than full blown motte and bailey castle such as Kendal's Castle Howe. 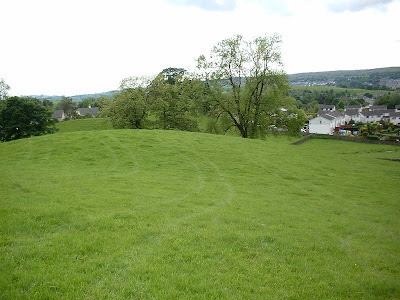 Just outside Kendal, there is a motte, visited last year, that lends some weight to the "is it - or isn't it" argument. Situated about two miles West of Kendal on Hawes Lane just outside Natland, Hawes Bridge Motte is mostly hidden from view from the road. The earthwork remains sit just above the river Kent, appearing to defend the river crossing. The motte stands in an area generally thought to contain the remains of a deserted medieval settlement called Bothelford, which was mentioned in the Domesday Book. The remains stand to around six metres high and would have afforded a good view of the river crossing and the surrounding country side. There do not appear to be any remains of banks and\or ditches. There is a question hanging over the validity of this motte, in that it's very near to the route of the Lancaster to Kendal canal, so there is every possibilty that it's actually a spoil heap. Still the location looks good for a defensive site at the river crossing, and so near to the possibly deserted village. The first of these 'mottes' is also known as High Gravestone Field.The identification as a motte, which I believe was made by Mary Higham, is disputed. Denis Perriam and John Robinson who support the assertion that this is a drumlin (a glacial mound) or possible a spoil heap left over from building the London and North Western Railway.